Teacher by day. Runner before & after office hours. Wife & mother 24/7. This was a spur of the moment race since I was just invited to do this days before. I knew that I wouldn't be able to do any long runs for April so I didn't join any races above 10km. 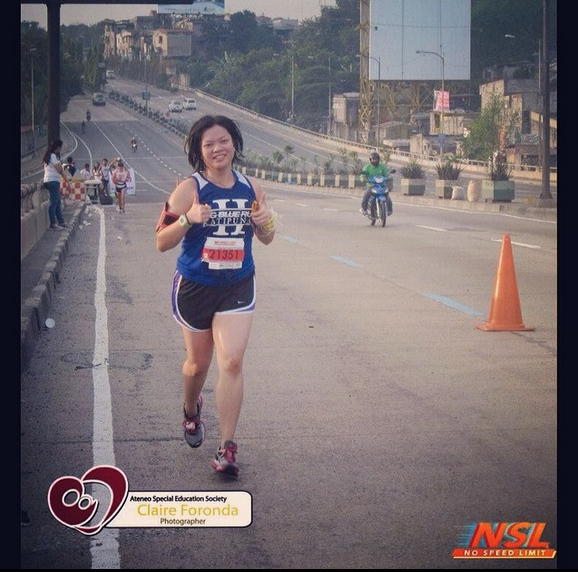 I have one in line for April 27 - Takbo Mo, Buhay Ko, a benefit run for rebuilding homes in Tacloban. So, anyway, I was invited by Alvin (not husband) to do this since he had extra race kits. I obliged since I thought this was better than doing a 10km (which I planned on anyway) on my own! I wasn't sure where Quirino Grand Stand was (sorry, hehe) so I asked to hitch with him. Still on a running high as I was finally able to beat my PR in this race! So far, my fastest 21km was last December when I did Milo Marathon Finals. I was pressured then because of the 2:30 cut off so I really tried to run fast. 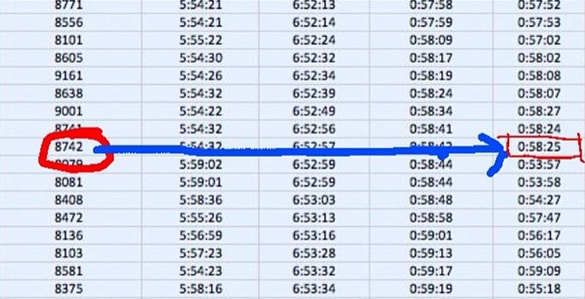 In January, I did 7/11 21km but finished slower at 2:26. But yesterday... I finished at... drum roll please... 2:18!!! If you know me, you would also know that I am all sorts of slow. I used to run 5KMs at 45minutes (when I started running again after the baby). 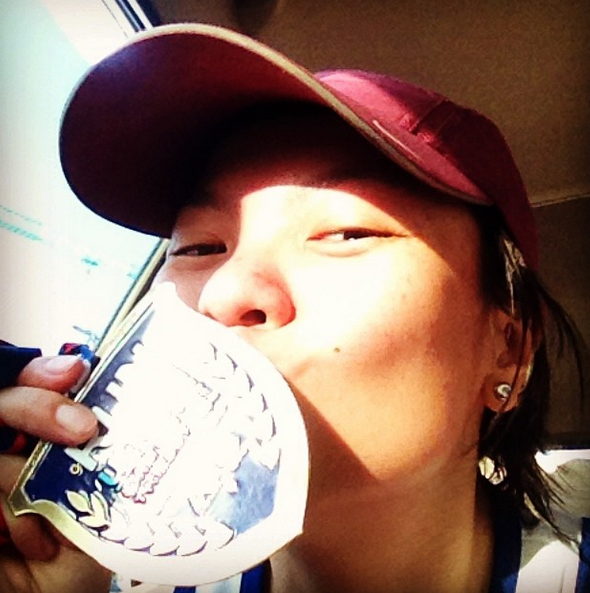 My longest half-marathon, I finished 3hours at QCIM December 2012. So this is just crazy fast for me. And I did not even feel a hint of being tired or spent the entire race (maybe except for the last KM when I had to push a little harder and run faster). What's my secret? Definitely doing speed intervals in the gym. I really made it a point to run intervals at least once a week to make sure that my legs got used to running faster. The importance of speed intervals is something I've known of since time immemorial, of course Alvin always kept making me kulit about this but I guess I've just recently (maybe this school year) been interested in running faster, not just longer. Back to the race, of course this is RunRio organized so you expect nothing but the best - more than enough hydration stations with both cold water and Gatorade, well-lit roads (very much needed as gun start was at 4AM) and easy claiming of Finisher's Shirt. This is what I call money well-spent. So, what did I do differently before and during this race, which may have helped in gaining a new PR? 2) Ran the last KM with a friend (hubby's officemate) who I bumped into. I told him to run faster and pull me alongside him so we could finish strong together! 3) Warmed up with a 5-minute run. I NEVER warm up before a race. I think that's why I usually start the first few KMs really slow at about 7:30-8:00/km. This time I started with 7:00/km! 4) Took 2 GU Roctane gels (one at 11KMs and another at 17KMs). I normally just take the regular one but also invested on Roctane ones which were double the price, worth it! 5) Did not do a long run a weekend before the race, instead did an hour long of intervals on the treadmill. Coach Carlo who I met through Gold's Gym (he's a traithlete and a 1:29 half-marathoner) told me that doing a long run a weekend before the race will just slow me down. Anyway I did 20KMs already 2 weekends before the race so that should be enough. 6) Did speed and hill intervals on the gym 1-2x a week for the past 5 weeks! 8) Lost 5pounds by replacing dinner with smoothies. I'd put in an assortment of fruits and veggies in the blender and spin away. I only ate dinner when I was running early morning the next day. I don't know which one exactly worked but I guess it's a combination of all those and just the sheer drive and passion to be better and stronger. I'm still aiming at a sub2 half-marathon. I'm in no rush, just taking it one race after the other. Hopefully, I will be able to achieve that by the end of this year. Thank You Lord, for this new achievement! It took me so long to finally write this post because I was too upset to do so, haha! Did not have the gana to write about it. But anyway, it's been over a month already and since I want to write about the Run United1 experience, I HAVE to write about this first, haha! No Speed Limit is a benefit run by an Ateneo organization, SPEED. Basically, it's a socially-oriented organization that allows the students exposure to underprivileged special children (I hope I got it right, this is what I remember from my college days). In 2012, I did this run but joined only the 3km distance as I was 7months pregnant and mostly of course, walked the distance. In 2013, they scheduled it on the same date as Chinese New Year so that ruled out my chances of joining (unless I blow my father's top). So, this year, I told myself I have to join the run! At least to help the many former students I have who are now part of SPEED. I signed up quite early (through a former student, Meg) that I was I think one of the first 3 registrants for the 21km distance, haha. Excited, much. I was looking forward to running along Marcos Highway as I have never done so. I was surprised to see that gunstart for the half-marathon was at 5AM! Given that I more or less finish a 21km distance at around 2 hours and 30 minutes, that would mean finishing at 7:30AM which is already quite hot! Anyway, couldn't do anything. I was on my own (as I always am these days at races) waiting for gun start to commence when it just wouldn't! I was already annoyed at the 5AM gunstart so it did not help that they started about 20minutes later. Again, what can I do? We started running around the Ateneo campus. From Henry Lee Irwin theater towards the High School, then out to Katipunan passing through Bellarmine Hall and then Gate 3. So far, so good. Hydration stations were enough although they only served water. No problemo. We ran out to Katipunan then went up Katipunan flyover. We made a u-turn somewhere along it going towards Sta. Clara Church then to Marcos Highway - it was a fun downhill which only meant one thing. We would have to go up that in an hour or two. I'm not very familiar with Marcos Highway so I just followed everyone else. Passed SM Marikina, Sta. Lucia East Mall (I know only until here) then u-turned back. We passed the same route going back and looking at my watch, I thought, if we (I don't remember the actual distances/digits anymore) run back the exact same route, it won't be 21KMs. Unless we go around Ateneo again when we get in for the last few KMs. As we entered Ateneo, I've never been this upset to see the finish line! :)) Normally it was a such a relief to see the finish arc. Not this time. So I sped up to the finish line, got my medal, checked my watch again and there you have it - not even 18KMs. I walked around and chatted up the others who also had GPS watches and they confirmed that the race was indeed short of about 3KMs. Don't get me wrong, I don't want to appear mayabang but I felt a little cheated. We paid P900 for a race that didn't offer anything but water, started late and even did not measure 21KMs :( I get that it's for charity so fine, I don't mind so much that hydration stations only offered water, but sana naman umabot ng 21KM. ANYWAY, I tried looking for some SPEED members who were former students to give my complaints, I mean, feedback to and then decided to just shrug it off. 1 ) It is student-organized. They have classes, due dates, reports, projects...and are not being paid for the work they do. It is completely volunteer-work... on top of their academics. 2) Proceeds go to the needs of special children so will just focus on that 3) At least I got a nice photo for it (just don't mind my hair) - see below. Greg and I left the house an hour before gun start (which has been the routine whether race is in MOA area or BGC). Got to the venue at around 4:00 AM which was pretty early for 4:30 AM gun start. So I had time to look around, listen in on other runners' pre-race chika (not my fault, they were talking loudly!). I was a little upset to find lots of people carrying portable music players when I clearly read on the guidelines that these devices would not be allowed - I normally run with music and so not bringing them was a big sacrifice. Oh well, didn't want my attention to have to be called for not following rules! Gun start was prompt at 4:30 AM and off we were! It was my first time at Aseana so I was a little excited. Kuya Kim earlier greeted the runners as he was also running 21km. He mentioned that the weather + easy route should be conducive to breaking a PR so I was hopeful. Throughout the run, I felt pretty strong and did not feel any knee, leg or sole pain. Although I do think I was running pretty conservatively at around 6:50-7:00 pace, I thought to myself, I wasn't in this for a PR anyway. Since I didn't do speed training and lacked in the long runs. I just really wished I could finish sub 2:30. I ended up with a time of 2:27. Sub 2:30! Thank You, Lord! A month ago, New Balance Power Run 25km. Problem: Super undertrained for this run. I lacked long runs... As a matter of fact, I did not do any long run since NB Power Run! Hah. I just registered for Milo since it was cheap and I was looking for a December run. Anyway, I tried cramming my LSDs early this week, did 2 consecutive 10KMs, Monday and Tuesday. Last week I did one 10KM and that's it plus a couple of spinning classes here and there. The culprit for no long runs? Yaya leaving for the province for a little over a week plus being busy with other things. All creative excuses came to mind last night - maybe I'm not ready, skip ko nalang ito... Anyway P600 lang naman ito. Just sleep in... and the list goes on. But of course, the more I wanted to skip it, the more I wanted to do it to prove that I am stronger than laziness! So, off to MOA I went, with our ever trusty and supportive driver, Greg. This time, I wasn't running with anyone. 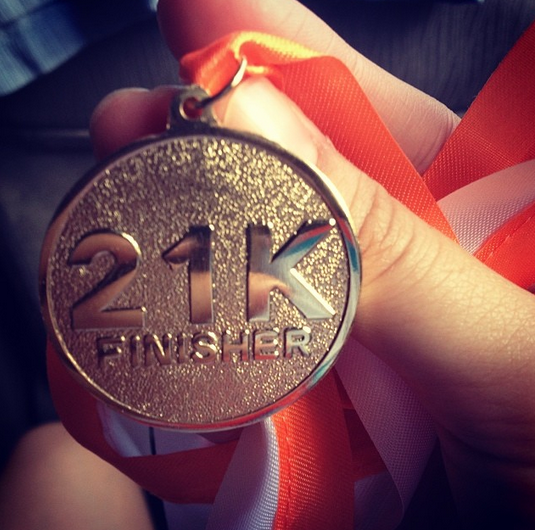 I registered on my own and ran on my own from KM 1 to 21. I started off on a bad note, at about KM 6 I was already hungry (WHAT?! After eating a cup and a half of rice last night with homemade Kare-Kare?!!). I think it was because I skipped my usual PB sandwich on the way to MOA and traded it for extra sleep. I was watching out for bananas (which I never saw, BTW) in the hopes of easing my hunger. Thank God I eventually forgot being hungry... maybe because all other aches and pains came to consciousness, haha. At about KM 12, I thanked God I was more than halfway through. I did not check out the race route so I was thinking this would be the same route as RU3 which was all flat, no flyovers. Well, surprise, surprise! We had to cross 2 flyovers over Roxas Blvd.! When I saw that uphill, I seriously wanted to cry... don't ask me how I felt when I saw ANOTHER uphill. HAHAHA. Success! I conquered my longest distance yet since TBR's Dream Marathon in February 2013 and it was great! I finished within the time I wanted to which is 3 hours (2:59, hehe). Looking forward to doing a better 25km next year. 1) Rescue Run 2013, which I didn't run since I didn't have a yaya whole week last week, which also explains the zero mileage. Well, not really. Did 3km last Tuesday as my recovery run but that's it. Anyway, I registered just the same to serve as my donation for the typhoon victims. Call my crazy but today I walked home from the gym. I live in the Sta. Mesa/Manila area and the gym is in Xavier School, Greenhills. Normally, I'd take a bus ride home which is the most convenient way. That is, if the driver is unavailable for me to use. I've always wanted to try walking because anyway according to the app Waze, I only live 2.6KMs away. So in the gym, I did my long run (did not take note of the KMs anymore, just made sure to run 2 hours straight) and did some strength exercises after (lunges, squats, weights, push-ups, sit-ups, etc). Gym selfie in between weighted squats. Must work on those arms! I finished at 11AM and told myself, okay, since there's no work and I'm in no rush, today, I will walk home. From Xavier, I walked out to Ortigas Avenue and walked straight until I reached Santolan. Turned in to M. Paterno - where I started to feel hunger pangs! Hahaha. After all, I just had a peanut butter sandwich pre-run and 2 small bananas while running. I stopped at a vendor to buy puto and was told, "Naku ma'am, sold out na po!" WHAT?! Ugh. So I walked some more... and saw a buko vendor! I ordered a glass and was happy (even if that glass tasted more like water than buko. Sad). I reached N. Domingo and turned left and walked more... Until I reached Araneta Avenue, the bridge and was relieved. Malapit na. After 48 minutes, I finally reach home. I'm glad I crossed that off my to-do list but will I do it again? Probably not - streets in the Manila simply do not encourage walking. Plus, I'd die of pollution if I were to do this regularly.